I have unlimited data and just received this email... tempted to see if I should do this now. I use no more than 10GB a month and is always nice not having to worry about data usage. That's a good deal. I can go to the 36 GB and save $50. I got on the double data when I was on $150 for 20GB/month and I barely hit 30GB. Not a bad deal as long as you don't go over that . I'm still undecided of I want to give up my unlimited. Once gone, it is gone for good. wow, with my 17% discount, that would actually be tempting since it includes (legally) the hotspot feature that I pay for occasionally..
My discount pretty much cancels all the taxes which means my two lines would run about $120 for 24GB... I only pay $125 now but no hotspot and only 700 minutes that we sometimes get close to... We only use around 10-15GB when leaving wifi on or 15-20GB with it off... Woudl be nice to know my plan is 'set' as opposed to at the moment they are trying to find ways to force us off Unlimited..
Was this offer emailed? I checked my inbox and online account but don't see the offer. Considering giving up my UDP also. I only received the email. I don't see it online either. I'm going to do this. I can save a lot of money a month. Has anyone managed to GET this deal on the terms stated in the email? I got exactly the same email as Joe378. Called in yesterday to change my plan & spent 2 hours on the phone with sales & customer service. They are NOT honoring the terms & conditions stated in the email. The email says NOTHING about FIOS. The restrictions on their written offer do NOT require a FIOS account to receive or maintain the double data offer. They shouldn't be able to renege on the terms & conditions stated in their written offer. Just to clarify: Yes, I am aware that VZW is running a double-data promo for FIOS customers. However, THIS email does not say that the offer is contingent on FIOS. The email offer is "Exclusively for you", so perhaps they sent it to me because I am a FIOS customer. 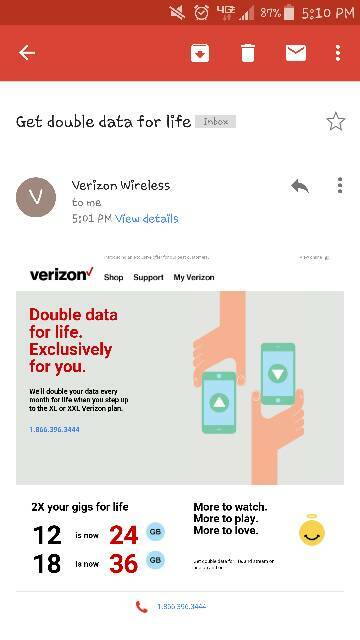 However, the restrictions in the email state that double data remains "as long as the line remains active on the XL (12GB) or XXL (18GB) Verizon plan". Thus, they shouldn't be able to drop the double data based on another contingency (such as "as long as FIOS remains active") which is NOT stated in the offer. I haven't done it yet as I'm still scared to give up my unlimited. That it total BS about having to keep fios. Same here. I don't use hundreds of GBs of data, maybe 10-12GBs a month, but still like to know I can stream or download without worrying about how much I've used. I use no more than 8gb a month between both unlimited lines on my plan and nice to not ever having to worry. My wife uses about 8-10GBs a month but we seldom switch to wifi when we are home. I could drop the UDP to save a few bucks, it's just tough to get rid of it! Ditched my unlimited years ago and it's saved us thousands of dollars. That's worth the peace of mind of occasionally watching our data usage for a day or two when we get close to our 15gb limit. To each their own. It's a trap!!! Verizon would like nothing more than for you to voluntarily give up unlimited data. Don't do it unless you are absolutely without a doubt ok in doing so. Because once it's done, it's gone, no going back. That fact alone is why I keep it even though most of the year I don't use more than 10GB/month (except during the NFL season when streaming a lot of games) and could probably save a few bucks overall on a limited plan. But the convenience of never needing Wi-Fi or the peace of mind of never having to worry about your data usage (whether just the device itself or if used as a hotspot via FoxFi), is just too invaluable!!! ONE Thing Is Standing Between Me & S7 Edge... That Dang Camera!